On April 7, 2018, PFLAG hosts, in conjunction with COCC LGBTQ & Ally Club and OUT Central Oregon, “An Evening with Kristin Beck”. The evening is marked with the showing of the CNN Film “Lady Valor: The Kristin Beck Story.” Kristin will then give a talk followed by a questions & answers session. Afterward, great photo opportunities with Kristin will be available. Christopher T. Beck served twenty years with the U.S. Navy SEALs, taking part in thirteen deployments, including seven combat deployments. Beck was a member of the United States Naval Special Warfare Development Group (known as DEVGRU) and SEAL Team Six, a special counterterrorism unit. Beck is highly decorated, having received a Bronze Star for Valor for heroism in combat, two Defense Meritorious Service medals, and a Purple Heart. Retiring from the Navy in 2011, Beck took a brave step forward toward a new future. After suffering with lifelong gender dysphoria, which contributed to his inability to emotionally mature while being in a male body, Beck began her transition by dressing as a woman. She changed her name from Christopher to Kristin. In 2013, Beck started hormone therapy, preparing herself for sexual reassignment surgery. 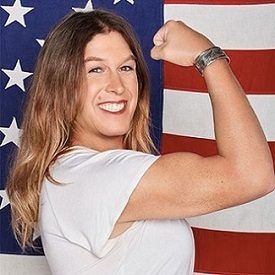 Since coming out in 2011, Kristin Beck has addressed the Pentagon, been a guest speaker at numerous colleges and events throughout the country, and has been a guest Grand Marshal for Pride celebrations. From the boots-on-the-ground search for Osama Bin Ladin to the high-heels-on-the-ground work for gender awareness – Beck has been a leader for many. KPOV interviewed PFLAG and OUT Central Oregon about this event on April 4, 2018 on their morning program The Point – ‘The Rainbow Edition’.